City, other agencies coordinated to stop flooding, remove abandoned dams on site. In late November, the West Linn Beaver Ambassadors group led a "Full Moon Rises" expedition to teach attendees about the local beaver population and its effects — both positive and negative — on the community. Just a couple weeks later, some of those effects were seen in real time as flooding was reported on 4th Street near its intersection with Volpp Street along the riverfront, next to a retaining pond owned by Clackamas County Water Environment Services (WES), the organization that treats West Linn's sewage. 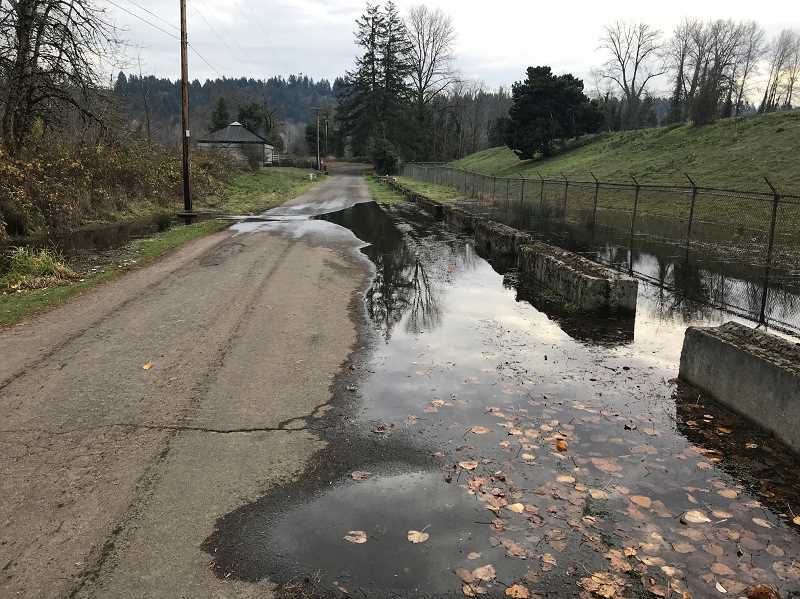 In a memo to the West Linn City Council Dec. 20, City Manager Eileen Stein said 4th Street was closed to vehicle traffic and the flooding was caused by beaver dams downstream from the pond as well as blockage in a road culvert. "There is no damage to any private buildings/structures, however, Public Works is coordinating with WES on a manhole that is leaking storm water into the sewer system," Stein said in the memo. "There is still access available to all homes in the area." In the weeks following, the public works department coordinated with WES, the Oregon Department of Fish and Wildlife and PGE — which owns the property where one of the beaver dams was found — to deal with the dams. According to PGE spokesperson Andrea Platt, the dams were found to be abandoned and they were removed. "PGE met with the City of West Linn at the locations of the non-active beaver dams and removed debris to drain the water that was contributing to high water at the road," Platt said. "The area is now draining freely and there are no signs of beaver activity attempting to rebuild." The road has been reopened for traffic, according to the City. The pond was formerly owned by the Blue Heron Paper Company, which declared bankruptcy in 2009, for its mill effluent. WES purchased the 39-acre property containing the pond for $1.75 million in 2012. Following that purchase, the City engaged with WES on possibilities for using the property during future redevelopment on the waterfront, though the two parties have yet to come to an agreement. The City continues to put together plans for the waterfront, but it remains unclear what will be done at the pond. Any work in that area would also be predicated on decontamination of the pond.